After reading Tisha Richmond’s blog & book titled, “Make Learning Magical”, I wanted to give sketchnotes a try. The problem was, finding a good topic. In addition, I wanted to amp up the excitement to get my students to buy into the concept. 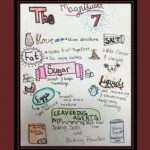 Since there are 7 baking ingredients, I decided to call them the “Magnificent 7” because of how well they work together, similar to the characters in the movie of the same name. The first day of sketchnotes was met with mixed reviews….some students grumbled, while others really got into it. Later, some of the students who were a bit skeptical said they actually liked it and found it relaxing! I loved that my students bought into this concept and I have to admit they were fun to grade! I’m finding that my students do better when they have a good balance of “hands-on” activities mixed with technology. 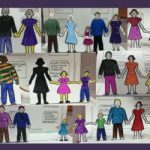 So, in this feature you will find my version of a “pop-up” style activity that revolves around the family structures. Students work in small groups to complete a “pop-up” of their assigned family structure, incorporating additional information. The “pop-ups” are then displayed and students participate in a gallery walk to learn more about each of the unique family structures. See below for more details!